Born on 1st February, 1953 at Kanpur, Po- Kamarda , Dist-Balesorein odissa. Sri Ramhari Daas Started initial training from his uncal Radhakrushna Das and undertook formal training from the illustrious odissi gurus, like pandit markandeya mohapatra, sangeet sudhakar Balakrushna Dash, Guru Gopal Chandra Panda and Bhikari Charan Bal in the odissi Vocal Department of Utkal Sangeed Mohavidyalaya, a premier Collage of Classical music and dance at Bhubaneswar . His served as lecturer in Utkal Sangeet Mahavidyalaya for 25 years from 1985 to2010 and become professor in faculty of performing Arts (Odissi Vocal) in Utkal University of culture, Bhubaneswar. He rendered remarkable service as Chief Executive Odissi Research Centre, Bhubaneswar for the promotion of Odissi Dance and music. A teacher, Singer, Researcher, author of many books and research articles on Odissi Music and composer of innumerable songs, Pallavis, Dance Dramas and other items of Odissi Dance and Music with impeccable symphony, has established himself as a leading torch-bearer of Odissi Musical Tradition. Innovation, refinement and perfection in singing has given him a distinctive identity. Endowed with a gifted voice with bewitching sweetness, clarity in utterance of words and pronunciation of phrases, subtle touch, a powerful yet delicate voice throw and an extraordinary sense of laya, variation in Swara Vistar, he has carved a niche in the classical musical streams of India. 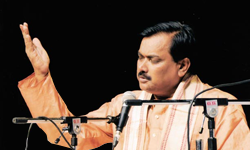 Has Excelled in presenting all the forms of Odissi Music like Odissi Raganga, Odissi Bhavanga, Odissi Natyanga, Champu, Chhaanda , Malashri, Pallavi, Geetagovinda, Janaana and Bhajan etc. By dint of his genius and devotion to Odissi Music , he has achieved many laurels, accolades and recognition at National and Inter National level. He has been performing both as solo and accompanying vocalist to odissi Dance inside the country and abroad since last three decades.